We respect your privacy, your details will not be given to any third party. You will get one star if your friend continues with us..
Just a quick mail to say thank you for organising this at the last minute. Our clients were meant to be eating out but were so impressed by the food you sent yesterday they asked if we could order again today :). Thank you so much for our lunch! We were very impressed with the freshness and quality of your food. Thanks very much for the catering. We had lots of comments about how good it was, such variety and plentiful supply! Want to speak to a real person about your catering requirements? "On-site catering: We can design, build and manage your workplace on-site catering facility, such as canteen or coffee shop. Or we can manage an existing facility. Vending solutions: how about fresh bean to cup coffee at your finger tips? Our state of the art coffee machines make this possible. We also supply a range of snack and drink vending machines. Office sundries: let us stock up on all your catering supplies such as tea, coffee, sugar, drinks and biscuits." 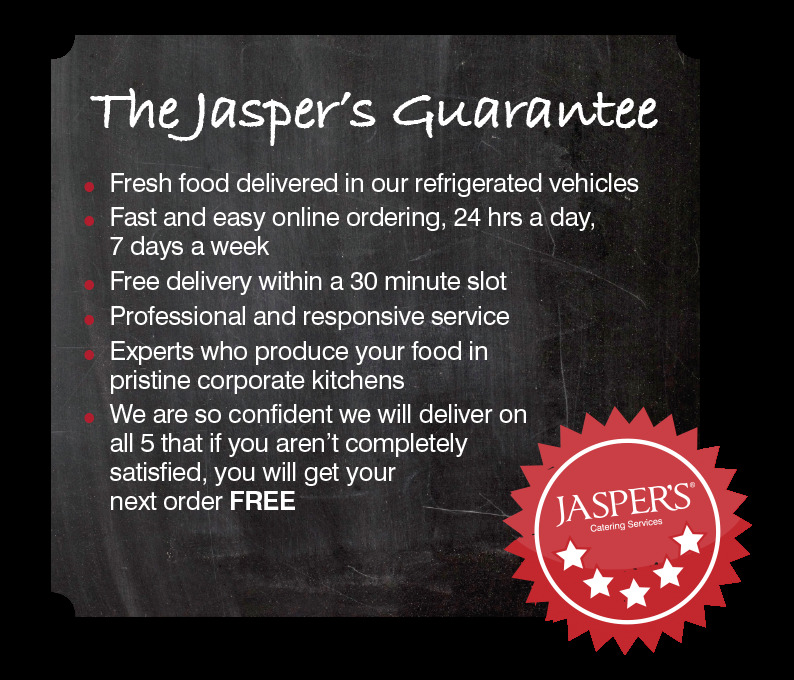 Copyright@2019 Jasper's Catering Services Ltd.
Business catering, office catering and buffet catering services in Ashfield; Bedford; Birmingham; Black Country; Bournemouth; Bromsgrove; Chester; Chesterfield; Coventry; Croydon; Epsom; Esher; Kidderminster; Leicester; Mansfield; Milton Keynes; Newcastle; Northampton; Poole; Redditch; Solihull; St Helens; Sunderland; Walsall; Warrington; Wednesbury; Wellingborough; Wolverhampton; Worcester. The delicious verity of eight tapas finger foods (both hot and chilled). Perfect to celebrate your party. The delicious verity of eight tapas finger foods (both hot and chilled). Perfect to celebrate your party.